Your gentle touch, your tender care. A smile as bright as sunshine; a heart of no compare. A spirit that will glow forever, in the memories that we share. Senate Education Committee Will Vote on "Aidan's Law" ON TUESDAY (June 11th) and we need your help!!! "Hello, my name is __________ and I am calling to encourage Senator ______ to vote in favor of SB 606, also known as, "Aidan's Law" when the Education Committee meets on Tuesday, June 11th. As a citizen of Pennsylvania, and as a parent, this is a bill that will undoubtedly save children's lives and I want to see it passed as soon as possible. I look forward to seeing Senator _______'s "yes" vote on Tuesday. Thank you." Adjust however you want, but that's the gist of all you have to say. Won't take long. Below is a list of the members of the state Senate Education Committee. If you can only make one or two phone calls, please consider calling a Republican member of the committee, as they have been a bit slower thus far to support the measure, as they don't like the idea of forcing more mandates upon school districts. We respect that, but feel the benefits of lives saved trump the fact that this is another thing districts have to do. Honestly, they should have been doing this already. I think it's safe to assume the co-sponsors will vote yes, so if you can call only one or a few, call the ones that do NOT have a co-sponsor label next to their name. If you have any questions, give me a call (484-678-9190) or shoot me an email (sjsilva12@gmail.com). Thank you, thank you, thank you for your help. Once I hear the results of Tuesday's vote, I'll update here. Until then, get on the phone!!! We learned today that Sen. Folmer, Majority Chair of the Senate Education Committee, is currently deciding whether or not to present our bill to the committee. If he does, and if the committee votes for our bill, it will then go to the Senate floor. So how important are your phone calls to Mr. Folmer at the moment? EXTREMELY!!!! Please take a second and make the call. Move that bill forward! Oh! ANY PENNSYLVANIA RESIDENT 18 YEARS OF AGE AND OLDER CAN CALL!!!! You don't have to live in his district. So ask your spouse, your friends, your co-workers, and your cool 20-year-old niece to make the call in support of SB 606. As you've learned, Aidan's Law (now officially SB 606) has successfully leaped over the first hurdle by making its way into committe-- THANKS TO YOUR PHONECALLS, EMAILS, and SIGNATURES. Your efforts have gotten the bill in the door of the PA Senate-- now, we need you to help it get to the floor. Our current challenge is to get the bill passed by the PA Senate Education Committee so that it will go to the full Senate Floor for a vote. If all goes well, then SB 606 is off to the State House of Representatives and we'll be halfway to making this proposed legislation a full-fledged state law. So we're again asking for your help. This past Monday marked thirty months since we lost Aidan, and in a bittersweet twist of irony, it was also the first day SB 606 officially spent in the Pennsylvania law-making process. Tomorrow at noon, there will be 30 hours left in the week until Harrisburg's halls clear out for the weekend. We want to bombard the Senate Education Committee with our support and urge them to vote for Aidan's Law/ SB 606. Can you carve out a few minutes of those 30 hours to help ensure that our schools will be heart-safe for kids? CONTACT THE MEMBERS OF THE SENATE EDUCATION COMMITTEE AND ASK THEM TO MOVE SB 606 TO THE FULL SENATE FLOOR FOR A VOTE. Senator Mike Folmer (R), Chair of the Senate Education Committee. He is the one who decides if the bill will even see the light of day in the committee itself. Call him, urge him to bring the bill to a vote, and encourage him to support SB 606. Sen. Folmer's phone number is 717-787-5708. The second person to call is Senator Dominic Pileggi (R), the Senate Majority Leader. As Senate Majority Leader, has the ability to use his position of leadership to encourage forward progress on any legislation in the Senate. What's more, over 20% of your signatures came from his district alone. Let him know! Urge HIM to encourage the Education Committee to bring SB 606 to a vote and ask him to support it as well. Trust us, he's WELL AWARE of this bill. Sen. Pileggi's phone number is: 717-787-4712. Remember, you can contact ANY of these senators. It DOES NOT MATTER which district you live in, as long as you're a PA resident. And please ask your spouse, friends, and any children ages 18 or older to do the same!!! I need your help. As many of you know, Steve and Christy Silva have recently developed legislation to require Automatic External Defibrillator's (AED) in every public school in PA. This legislation called "Aidan's Law" SB 606 is currently in the Senate Education Committee and needs to be voted on to move to the full floor. I ask you to please take a minute, right now, to call Senator Mike Folmer at 717-274-6735 and Senator Dominic Pileggi at 717-787-4712. Tell them you are a PA resident and you want them to protect our children's hearts by voting yes to "Aidan's Law" SB 606. If they don't answer, leave a message. Please make sure everyone in your house who is 18 calls, too! I will keep you posted as this important legislation moves through process. As always, thank you for your support and thank you for helping us make the effort to keep our kids here in Pennsylvania safe. Wait! We're Not Done! We Need (More of) Your Help!!! Hold on! Don't go anywhere! We can't put our feet up just yet! I've been getting a number of email/Facebook messages/texts saying, "Congrats on passing Aidan's Law!!!" But we haven't! Yet! I'm learning my civics lessons all over again, and if I've been misleading in any post, I apologize (it just means that I sent them out without first consulting with my wise husband, Mr. History Teacher-- AP US, no less). Do you love that picture or what?! So, where we are right now is THE SECOND BLUE CIRCLE FROM THE TOP ON THE LEFT, "Committee Hearings". Each 'down' arrow represents a passing vote, which enables the proposed legislation to move to the next level. The point is, WE STILL NEED YOUR HELP!!!! And actually, we probably will need it for some time-- you can see how many "bubbles" there are to jump through. Can we count on you? At this point, SB 606 is being considered by the Senate Education Committee for review. The senators on the committee will study it, research it, and will soon vote on it. If they vote "yes," we keep moving ahead, and SB 606 goes to the full Senate floor. If they vote "no," then we're done. Totally done. And Aidan's Law has no hope of getting passed. If SB 606 gets to the full Senate floor, it needs to be voted for again by the entire Senate. 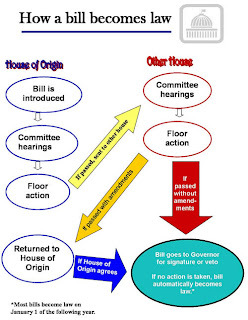 If passed, it goes to the House of Representatives, and much of the process is repeated. If it's not passed, we're done. Totally done. WHAT YOU CAN DO RIGHT NOW: Regardless of which/whose senatorial district you live in, PLEASE CALL, EMAIL, or WRITE ANY OR ALL (all would be optimal, of course) SENATORS OF THE EDUCATION COMMITTEE, particularly Mr. Folmer, the majority chair of the committee. Click here to view the Education Committee homepage; click any name to reveal his contact information. THIS STEP IS AS IMPORTANT AS THE LAST-- signing the petition and calling your local senators is what got us IN the committee-- now we need to get ON the full Senate floor. Two minutes, maybe ten, to ensure that you've done your part at this juncture to better protect kids' hearts in PA-- inaction at this point could negate the efforts you've already taken. PLEASE CONTACT THE SENATE EDUCATION COMMITTEE TODAY!!! We have no word on when they will be voting on Aidan's Law/ SB 606. We'll keep you updated. Click on image to sign petition-- we'll keep collecting! THANK YOU TO EVERYONE WHO HELPED US REACH OUR GOAL OF 2,500 SIGNATURES FOR AIDAN'S LAW (PA Senate Bill 606)!!!! What an incredible impact you've made!!!!!! Thank you to the 250 out-of-state signees as well! Your response is so appreciated! Great gratitude to everyone inspired to act to keep kids' hearts safe in PA! We learned Friday night that SB 606 (Aidan's Law) is now in the hands of the PENNSYLVANIA SENATE EDUCATION COMMITTEE. What's next? Regardless of what district you live in, CALL OR EMAIL THE MEMBERS OF THE SENATE EDUCATION COMMITTEE AND ASK THEM TO MOVE SB 606 TO THE FULL FLOOR. Obviously, your signatures and calls work! So please keep it going!!! There it is, everyone! There it is. Aidan's Law for AEDs in Schools is officially Senate Bill 606. WOW. There are so many emotions running high right now. Senator Dinniman introduced our legislation to the Pennsylvania Senate yesterday, and it was well-enough received to be referred into committee. We're now awaiting word of which committee SB 606 will be assigned to. A HUGE first step!!!!! CONGRATS to all who have had a hand in getting us here!!! Oh-- and we're just 21 signatures shy of 2,500 on the petition-- can we close out the day at 2,500??? Have a great weekend, PA! SENATOR DINNIMAN WILL BE INTRODUCING OUR AED BILL, AIDAN'S LAW, INTO THE PENNSYLVANIA SENATE TODAY!!!! And you, awesome supporters, have brought on FOUR MORE SENATORS to co-sponsor the bill, bringing the total number, including Senator Dinniman, to SEVENTEEN!!! Our gratitude goes out to every single person who has signed our petition, made a phonecall to his or her senator, and spread word in support of requiring AEDs in public schools in PA. You are doing it!!!! This is going to happen!!!! That's 17 out of Pennsylvania's 50 senatorial districts!!! HUGE!!!!! WE'LL KEEP YOU POSTED AS SOON AS WE GET WORD!!!! The First Annual 5K For Aidan J.!!! Get Ready for the 3rd Annual 5K for Aidan J.: June 15, 2013!